Ballymore Stables has been enjoying a stellar run of form of late and we are hoping our good fortune continues this week with three nice horses contesting races at Ballarat and Warwick Farm on Wednesday. The first of whom is Maroon Creek who lines up for just his second start in the City Of Ballarat Handicap. Whilst he did not show a great deal at debut, the son of Zabeel is a "lovely type of horse" who has been showing ability at home. "We are hoping that the step up to the 1600m and the rain affected track will see an improved performance from him," said Michael Moroney. "He is a real staying type who may need blinkers but we are giving him the benefit of the doubt at this stage and we are hoping that he will be a big improver." In the following race, a BM64 event, we have Beyond Purple (pictured) fresh over 1100m. Whilst she lost form at the end of her debut preparation, the daughter of Reward For Effort was a debut winner late last year and she has plenty of natural pace. "She has just the one jump-out off a short break and this looks a nice race for her," Moroney reported. 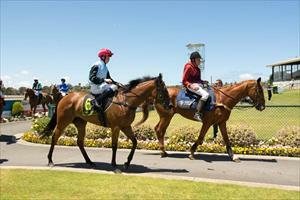 Meanwhile in Sydney we have Golden Patch taking his place in the opening event at Warwick Farm, a 1200m maiden. Showing ability during a brief spring campaign, the son of Sebring has progressed nicely since, faring well in a couple of recent jump-outs and striking what looks to be "an even sort of race." "He should not take long to clear his maiden," Moroney said.